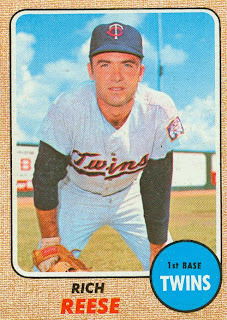 Rich Reese played 866 games in a 10-year career spanning 1964-73, all with the Twins, except for 59 games with the Tigers in 1973. Reese was signed by the Tigers in 1962. After his first season, the Twins selected him in the minor-league draft. Reese played in the minors through the 1966 season, mostly as a 1st baseman, although in most of his 1966 games he was an outfielder. 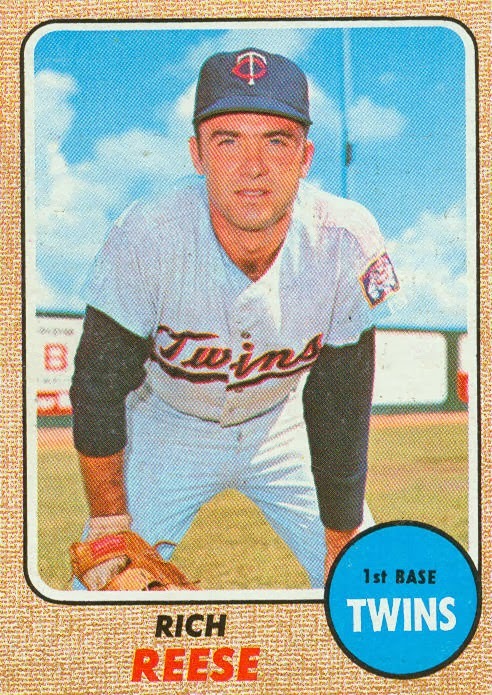 Rich played several games with the Twins in ’64, ’65, and ’66, then made the Twins roster at the start of the 1967 season. He played 95 games in his rookie season, mostly as a pinch-hitter and occasional defensive replacement at 1st base (only starting 4 games). In 1968, Harmon Killebrew started 77 of the first 80 games at 1st base, then was out of the lineup from July 8th until mid-September. Reese filled in during this time, and ended up starting 64 games at 1st base. 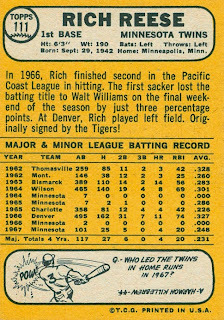 Rich became the primary 1st baseman in 1969, making 95 starts to Killebrew’s 66. (Harmon played most of his games at 3rd base, since the previous 3rd-sacker (Rich Rollins) was drafted by the Seattle Pilots.) Reese’s playing time increased in 1970, as he started 127 games. He also appeared in the ALCS in ’69 and ’70. His playing time decreased beginning in 1971, as Killebrew began playing more at 1st base, with Reese clearly the backup by 1972, making only 26 starts. After the ’72 season, Reese was sold back to the Tigers, where he was the backup at 1st base and left field. 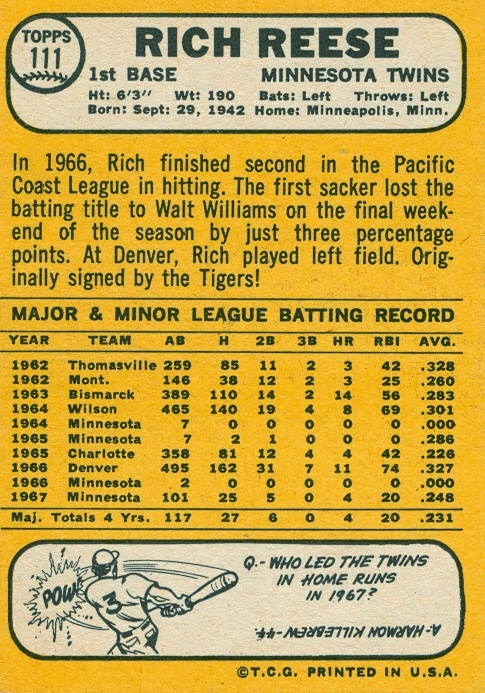 After his mid-August release, he was re-signed by the Twins, and finished out the 1973 season with them before retiring. Reese struck out 270 times in 2,020 career at-bats, but two are part of major-league history. On May 8, 1968 he fanned, completing Catfish Hunter’s perfect game. On September 27, 1973 Reese was Nolan Ryan’s 383rd strikeout victim, enabling Ryan to break Sandy Koufax’ single-season record. On the plus side for Reese, he had a pinch-hit grand slam in August 1969 against the Orioles, breaking Dave McNally’s 17-game winning streak.